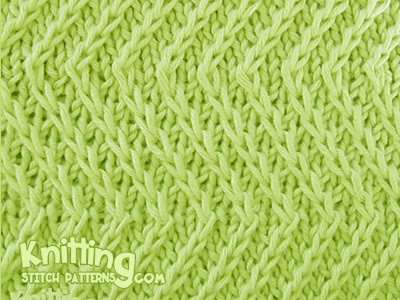 Slip stitch purlwise with yarn in front: Sl. Right twist: RT - Skip 1 stitch and knit the second stitch, leave on needle; then knit the skipped stitch, slip both stitches from the needle together. Left twist: LT - Skip 1 stitch and knit into back of second stitch, leave on needle; then knit the skipped stitch, slip both stitches from the needle together. Instructions: Cast on a multiple of 6 sts +3. Row 1: * K1, RT; repeat from * to end. Row 2: * P1, sl 1, p1; repeat from * to end. Row 3: * RT, k1; repeat from * to end. Row 4: * P2, sl 1; repeat from * to end. Row 5: K2, * RT, k1; repeat from * to last st, k1. Row 6: * Sl 1, p2; repeat from * to end. Rows 7 through 12: Repeat rows 1 through 6. Row 13: * K1, RT; repeat from * to end. Row 14: * P1, sl 1, p1; repeat from * to end. Row 15: * K1, LT; repeat from * to end. Row 16: * Sl 1, p2; repeat from * to end. Row 17: K2, * LT, k1; repeat from * to last st, k1. Row 18: * P2, sl 1; repeat from * to end. Row 19: * LT, k1; repeat from * to end. Row 20: * P1, sl 1, p1; repeat from * to end. Rows 21 through 26: Repeat rows 15 through 20. Row 27: * K1, LT; repeat from * to end. Row 28: * Sl 1, p2; repeat from * to end.